We paint the moulding in our shop with air-spray equipment so that your home stays clean and the moulding has a smooth finish. Our technique prevents uneven brush strokes, visible seams and minimizes chaulking and nail hole fills. We guarantee that you will not see any nail holes or joining seams in our finished installation. Our excellent workmanship comes with a 100% lifetime warantee. I saw their add in the local paper and checked them out on Angie's list before calling. The owner actually has a place of business, so I went there just to see the shop. I asked him if he contracted the work or if they worked directly for him. He said that he trained them and that they work for him. I stopped using contractors a long time ago. He has displays of different styles of doors and casing and other trim. We chose solid, raised, four panel doors with brushed nickel hinges. The customer provides the knobs. The installers arrived a few minutes early. They actually arrived before the phone call from the office, which was shortly after they arrived. One thing I look for is prep work. They arrived with all their tools. They didn't just arrive and start ripping out doors. They set up their saw and other tools in the driveway, covered the floors then removed the old doors and jambs. I never felt like they were rushing to just finish the job and leave. The new doors arrived shortly after the prep work was complete then started the process of installing the doors. In an old house that isn't plumb or level they had to work a little with each door. They used long screws for the hinges which go into the house framing and not just the jamb. This is the preferred method. They took a short lunch break and went back to work. The total time that day was from 8:30 to 5:00. One of the installers returned the next day to caulk and make sure that everything had been done. They offered to touch up the paint around the doors but I didn't have any of the paint. I'm very happy with their work and would recommend them. I was working in Coto de Caza with a customer her named Jenn. I was doing the designing for her home and also her new flooring (tile) as well. She needed new baseboards once the tile was finished so I brought my two finished-contractors and asked for them to give her a quote. Her walls had curves and needed a flex mould which is made of rubber and meant to bend and give the illusion of a curved wood, this material is expensive. Jenn was not satisfied with the quotes my contractors gave her. She told me that she had already received a quote from Art Of Moulding and that they were less than my two Contractors. I doubted the work could be any good and asked her if we could get a couple other quotes from different companies. 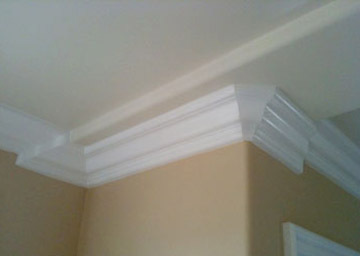 We did receive more estimates and the pricing was still higher then art of moulding. Jenn called art of moulding and cleared up there were no mistake on the quote he gave her and that it included the whole home for baseboards and Flex baseboards. Hisam at Art of Moulding confirmed. I was hesitant and had my doubt about the lowest price and seeing exactly what quality would come of it but it was fantastic! The job was done on time, saved my homeowner money and was seamless! That was the start of me working with Art of Moulding. When I need base, crown, flex or to replace interior doors, Art of Moulding is my team. My customers save a lot of money and got excellent results. We recently had hired a handy man to install base board and crown moulding. We purchased the moulding and painted it and were paying him labor. About the 2nd day on the job we received a magazine where you were offering a tremendous sale of moulding paint and installation for $6/LF. Well we were too far down the road at that point so we just said we would save the add for the next project. Lo and behold 2 days later our handyman comes to us and says he can't do the vaulted ceiling due to the angles. Not knowing what to do I called the number on your add. All I can say is WOW!!!. What a pleasant experience. I explained our problem to Heather. We had all the materials and were half way through the job but were stuck. She was amazing. She researched the cost and your teams availability and called back twice to make sure we had the details. She arranged an installation team the NEXT DAY. Then she called the next day to tell me they were on the way to our home. The install guys arrived early and worked all day. The moulding is up and looks terrific. Then this morning I got another callback from Heather to make sure everything went okay. I can honestly say I can't remember a better experience from the 1st call to the follow up call, timeliness, quality, price and courtesy by your entire team was fantastic. We were at a 4th of July party the next day and my wife told many people about the experience we just had and recommended your company be put in our association's "Recommended Vendor"list. We will certainly use Art of Moulding again and strongly recommend it to anyone in the future. Art of Moulding stands behinds its workmanship 100% and that's why we offer a lifetime warantee on our workmanship. See examples of how Art Of Moulding can transform your home or work space.